NEW! Add in a custom Tag Protector & Silencer. 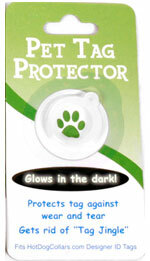 Keep your tag protected and stop "tag jingle"
Great price & even greater quality! Love the the heavy quality of materials used and the color really pops! These tags (I purchased 2 for both my dogs) will definitely stand the test time for two very active and stylish pups! Great first name tag for my puppy.